WTF ! Google does it again – Gives away half of Kashmir to Pakistan on its Map ! 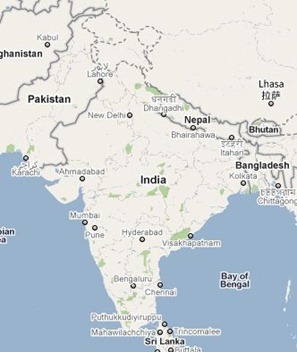 I am not sure why Google is doing this – Repeatedly Google has been messing around with India’s Map, especially the Northern India-Pakistan border. Google Insights, which offers analytics on searches done on the search engines now shows Pakistan occupied Kashmir (PoK) is part of Pakistan. Just few days back Google had announced that their upgrade on Mapping systems, where the Geo-Political boundaries are shown with more precision and any areas that are disputed will be shown in dotted lines (see the Google Maps above). However, if you search on Google insights, that is not the case. It clearly shows PoK as part of Pakistan. It should have showed the whole area as disputed if not as part of India. Google has also goofed up earlier when it showed Arunachal Pradesh in Mandarin, giving impression that it is part of China. Documents, Web, Keyboard and Now even on mobile Handset – Indian Rupee Symbol everywhere ! Google Street View Rejected In India; Are Security Concerns Stopping Innovation? The flip side mistake should also be brought to notice of the world. the Indian Occupied Kashmir is being shown as part of India despite being a disputed territory according to 1949 UN resolutions. Arun, Not only J&K, Even North East State of Arunachal Pradesh is also partly missing in the map , Please highlight the same also…. Google should be banned in India for doing like this. Special status in Indian constitution should not be given to Kashmir and the Common Civil Law should be implemented to solve the Kashmir issue. This is impossible in this current dynasty politics done by the present Indian govt. But Indian Government surely needs to bring this to Google’s notice in no uncertain terms ! 1. who will be the neighbouring countries of Aaazed Kashmir? 2. What kind of revenue would come to country? 3. would Pakistan still stop the 1000 cut theory? Imagine after paying the local lads to throw stones for years, would Pakistan let is go so easily? 4. The governments will collpase and adminsitration would not be able to take the fragile independence for long. Look at afghanistan and Iraq as examples! Deplorable yes. However, it is also a sad that we believe national borders will get determined by how a private corporation chooses to depicts them in their interpretation.